A wedding is a holy ceremony that brings together two special people and binds them in the bond of holy matrimony. For an occasion, this large and joyous, wedding rings are made to commemorate and preserve memories forever. Wedding rings are gentle reminders of the beautiful times. However, it is not a great idea to let someone else shape the ring that binds your marriage. With custom made wedding rings, you have the ability to put your ideas in and forge the dream ring. There are many different kinds of custom wedding rings available in the market today. They vary on the basis of shapes and sizes of prongs, shanks and stones, etc. There are many different options to choose from. While people may not be too comfortable with the idea of custom wedding rings, there are a lot benefits that they do not know about. Expression– Customizing and creating your own wedding ring only goes to prove how dedicated and thoughtful you are. This is a gesture that your partner will love and the ring will be all the more special. Wedding rings are always an expression of love and nothing speaks the language of love like custom made wedding rings do. You can incorporate ideas that your partner likes or has always wanted in his or her wedding ring and add a personal touch to it. Uniqueness– Wedding rings are nice to look at but the monotony is real. There is nothing special or different apart from the sizes and shapes. However, custom made wedding rings can be forged from scratch and made into whatever you want. This allows the ring to be exclusive and entirely unique, just like your marriage. A custom wedding ring will always succeed in making your partner feel special and unique because that is not something anybody can find elsewhere. Head and Shank– Sometimes, the rings turn out to be uncomfortable from the partner, because they are either too tight for the finger or too high, which makes it look weird. This is a problem that automatically is solved with custom made wedding rings. You can adjust the height of the head and shank and customize the shank for a comfortable fit for your partner so that the love does not turn out to be a tough love at the end of the day. Detailing– Custom rings require immense precision and skill. The workers employed in making your perfect ring work meticulously to ensure you are not disappointed. All that hard work is reflected upon the perfection with which the ring is made. Presenting this ring to your partner not only fetch you an appreciation for the ring but admiration for the hard work and perseverance for your bond. Detailing is everything and intricate detailing is what makes the ordinary, extraordinary. 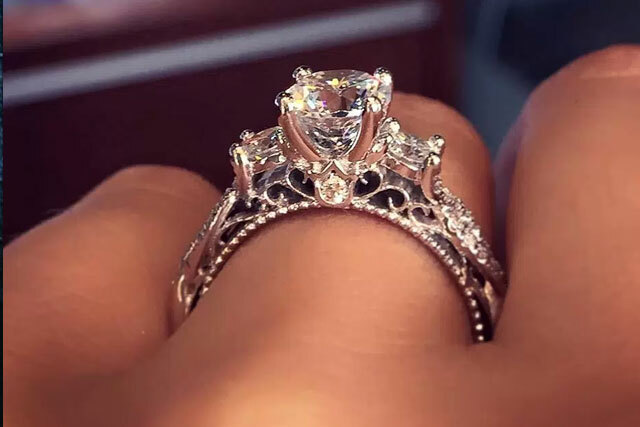 Choice of Prongs– Sometimes, the ring might be almost perfect but not quite. The prong shape and size may not be just as beautiful as you would want it to be. Custom made wedding rings allows the customer to pick out the prong size and shape as well. The most common shapes are heart-shaped, claw-shaped, Double Claw and Round prongs. With so many advantages to its name, custom made wedding rings are the perfect option if you want to show your partner what they mean to you. Ready-made rings are overhyped and custom wedding rings are the new thing.